Failing at Paid Search? Maybe You’re Just Measuring It Wrong. The lack of an appropriate and complete tracking system is one of the most common errors, or omissions, that B2B marketers make in setting up a paid search program. It’s easy to see why. Google, for example, provides basic tracking services – impressions, clicks, cost per click – automatically and at no charge as part of their default set-up. Going beyond that basic set-up, a critical step in being able to gauge the true success of any search campaign, requires a modest investment in time and resources that most companies figure they can live without. 3. which precise keywords are generating those actions at the lowest cost. Keep in mind that you may have separate goals for certain parts of the program. For example, you may wish to measure the performance of “branded terms” – the name of your company, product names, names of competitors – based on impressions, or even ad position, whereas more generic terms will be measured on Cost Per Lead or Cost Per Qualified Lead. Your tracking system can never be good enough. 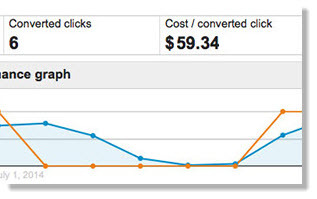 Don’t stop tracking at clicks, because you’ll have no idea how those clicks are converting into leads. Don’t stop tracking at leads, because you’ll have no idea how many of those leads are qualified, or which are converting into sales. Don’t stop tracking at sales, because you’ll have no idea how those sales are generating additional lifetime value. And so on. Most B2B marketers only measure clicks and cost per click for the reasons stated above. To the novice search marketer, seeing the number of clicks generated by your efforts can be rewarding, but they are only part of the story. In fact, simply knowing which terms are generating the most clicks or the lowest cost per click is generally worthless. That’s because the keywords that generate the most clicks are very often simply more generic terms that attract a wider spectrum of prospects. Likewise, terms that generate clicks at a low cost could be converting to leads (or sales) at a low rate, while other terms that generate clicks at a slightly higher cost could actually be your best performers. At a bare minimum, you should always implement some kind of conversion tracking so you’ll know which terms are generating actual leads or registrations. By tracking keyword conversions, you’ll be able to optimize your bid strategy and overall media spend. You’ll understand which keywords are responsible for driving desired actions, as well as which terms only drive costs without the desired pay-off. Excerpted from the Spear white paper: “Top 10 B2B Paid Search Mistakes: Why Your Google Adwords™ Campaign Isn’t Working and What to Do About It.” For a free copy, click here. This entry was posted in B2B Marketing, Campaign Measurement, Google AdWords, lead generation, PPC Advertising, search marketing, SEM and tagged Google AdWords, paid search, Paid Search Agency, Paid Search Consultants, Paid Search Tips, PPC, ppc best practices, SEM, sem best practices on February 24, 2015 by Howard Sewell.